Let the life we help others live be the measure of our success! #POWERFUL words, #POWERFUL choices, #POWERFUL actions! Find your words to become a #Learner, #Leader, #Lifer! Each of us is on a journey; a journey towards self-discovery, self-improvement, self-awareness, and hopefully self-actualization. While we are on our individual journies I believe that each of us has the capability to choose the words that guide us as we head towards our personal destinations. I believe that we have a responsibility to be thoughtful about those choices, and that we can effectuate positive changes in our worlds and the worlds that those we care about. I believe that if we do this we can all become expert #learners, #leaders and #lifers. Meaning, those that choose to learn, lead others, and appreciate each moment that lif has to offer. I bring this challenge to you to focus on the words that can support you on your journey. This challenge would be to take a look at the picture below that contains a number of words that I have dubbed #POWERFUL words, and to make some choices for yourself. 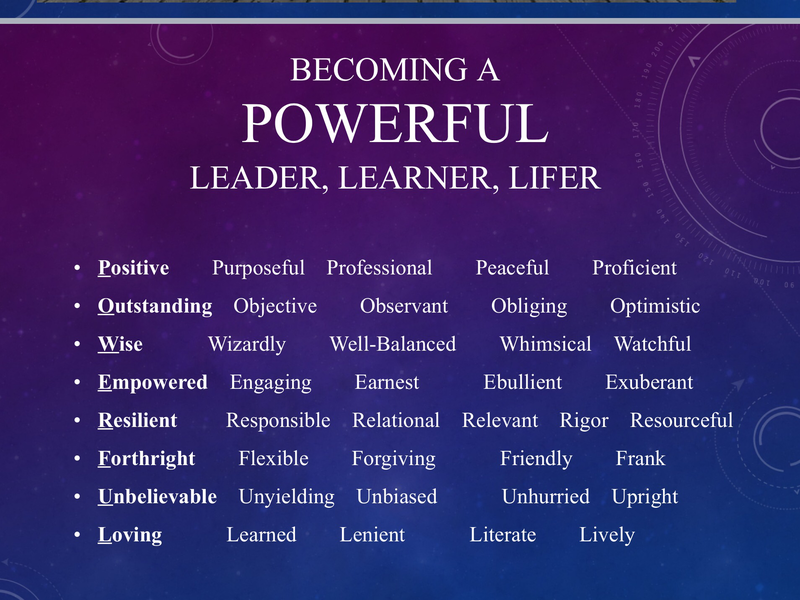 Choose the words that reflect who you are as a #POWERFUL person. Maybe you are a #learner, a #leader, or a #lifer, like me, or maybe you are simply seeking to be a little better than the day before, or quite possibly you are seeking to change the world with your magical powers. I think that no matter which level your journey is on that you can choose to make it a #POWERFUL one by forcusing on the words that give you your internal power. #Positive: Each moment of each day I choose my attitude. I choose to be positive, to look on the bright side, to relish the good that occurs in front of my eyes, and then I seek out the good that might go overlooked. Sometimes its the simplest of actions that people, I don’t even know do, such as holding a door for someone, or picking up a piece of trash that lays before them, to witnessing the engagement of an exceptional educator who is guiding the development of a group of students and educators all day long. #Outstanding: As I maneuver through my day I seek to be a shining light to those that might catch a glimpse of me in action. Not that I need to be the star of the show, but it’ that I feel a sense of responsibility to seek to be my best for the people I serve. I strive to give others an authentic look at how I go through life with what I hope are exceptional behaviors, actions, and positivity. I want to get that smile from an onlooker. I want to include people in my life. I seek to engage, and be present in what I hope is a memorable way towards the good. #Wise: I have had the opportunity to learn many life lessons, to become a learned man, to build a set of skills that guide my decisions and actions. I learned these things from life, from my parents, from those in my lives, from my teachers, from my colleagues, my children, and if I don’t act with regard of these lessons that I have learned, then I think that I wouldn’t give justice to these life experiences. I want to be thoughtful, be cognizant of the intelligence I have, use it for good, and allow my thoughts and actions to demonstrate who I truly am. #Empowered: It is my life. It is my choice. It is my heart, mind, and soul, that creates me, so it becomes a real action to be empowered through myself. If I were allow myself to be only directed by others, would that be enough? If I allowed myself to be swayed one way or another because of popular belief or persuasion or group mentality, would that be enough? I think not! To be empowered is to be aware, to know you have choices, then to choose consciously, and to let yourself recognize that you have independent thought and have acted on your own accord. 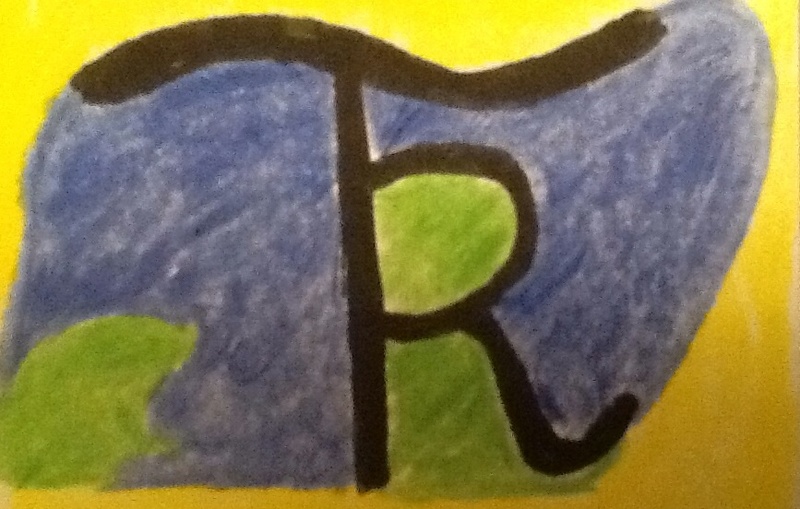 #Resilient: If you know me at all, you know that at my inner core, the issues of resilience ignite my life. Having the capability to come up against adversity, then to battle, fight, overcome, be the relentless individual that I can be, to persevere through any hardship that presents itself, is truly a learned skill set that I use each and every day. I also seek to help others recognize that they too have experienced resilience, and that each of our minds are afforded opportunities continuously to overcome the roadblocks paced before us. This power word is essential to my and my development, and for me represents a deep commitment to living. #Forthright: While there is always the need for tact and courtesy in providing information to people, especially information that might not be seen as positive to all ears, none of us have time to beat around the bush or to engage in miscommunication about important issues, topics, concepts, or with feedback that is designed to improve the lot of children, their parents, or those that work to build communities. So, to me, I feel a need to know my stuff, to know my positions, to know what I want to have occur, and then to work to communicate effectively with those that have interest or motivation to make things better. I find that by being thoughtful in my approach I am better able to hold crucial conversations with those in my life. #Unbelievable: Our world is filled with common and general experiences. Going to get gas in our cars, stopping by the grocery store to pick up a few things, or maybe even making a quick pit stop on a long journey to take care of business, are several of those common experiences. I want to give people an unbelievable experience when I am with them. Maybe it’s with my greeting, maybe its my customer service, maybe its just offering a warm hand to shake, or possibly its by exceeding someone’s expectations in a meeting, offering just a bit more that they were thinking our conversation would provide to them, or by busting out in a little song to lighten the mood. It isn’t always about showmanship, but the style in the show that you decide to provide. #Loving: I care about people. I truly want each person to succeed in their lives, and and I strive to be a loving person in my interactions with others. I love having an opportunity to work with people, to communicate with others, and to work in the education arena, where what we all do on a daily basis matters, and supports our shared future world. I love my family, my friends, my career, and my life. I love it! I am a #LIFER! What I mean by this is that I work to focus on the precious moments that I am given, and value the good and difficult moments that occur in my day, and I hope that you will join me in loving your life. The beauty of engaging in a process such as this and reflecting on the #POWERFUL words presented in this challenge, is that you do not need to choose my words! You can choose your own. You also do not need to choose words that I have provided as you can add your own. Your choice, your power, your actions, your opportunities to grow yourself, and then your opportunity to work to build the #POWERFUL attributes in each person that are in your world. Think about it, if each person you know actually focused on choosing their words, and enhancing their powers, then worked to build themselves up, and then focusd their energies to build the powers of others in their worlds, then we could actually instigate a dynamic change to our collective world by simply building on the super powers we all have to improve the world! Rob Martinez, Ed.D. is known as @ResiliencyGuy and AKA @DrRobM_FSUSD on twitter, and can bfound as “Resiliency Guy” on Facebook. He is becoming well known for his presentations on Transformational Resilience across California, and serves the Fairfield-Suisun Unified School District as the Assistant Superintendent of Human Resources. This entry was posted in Education, Guidance, Inspirational, Love and Emotion, Resilience, TransformationalResilience and tagged Education, inspiration, Powerful, Resilience, Resilient. #POWERFUL words, #POWERFUL choices, #POWERFUL actions! Find your words to become a #Learner, #Leader, #Lifer! So a year later I decided to walk through my #powerful word selection, and this is what I came up with today: #Positive #Outstanding #Warrior #Engaging #Resourceful #Fun #Unbelievable #Loving. So, several of my word are the same, and several have transformed, and that’s okay! -It is very important for each person to reflect on their personal power code, and then reflect on that code in order to empower themselves to take the actions that matter. Here’s hoping that you rethink your power, and live it to the fullest!